KEX Hostel i Reykjavik, Island : Boka nu! KEX. It's the Icelandic word for 'biscuit' and new social hostel in Reykjavik. What's not to love? 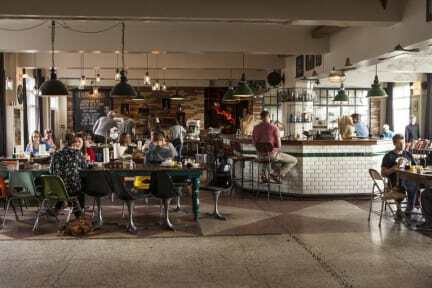 Housed in an old biscuit factory in the heart of Reykjavik, KEX is just steps from all the bars, clubs, and music venues that give this city its legendary reputation. It's also a painless distance from late-night munchies and a mind-boggling array of coffee houses, shops, and tourist attractions. Of course, you might not even want to venture outside of the hostel with all its features, including a café and bar, lounge area, heated outdoor patio, tourist information desk, laundry room and free Wi-Fi. In addition to our dormitory rooms we offer three different double rooms. The Double Plus has one double bed, a private bathroom, linens and towels and a fantastic seaside view. The Double Standard has one double bed (of the most clever convertible design in case you get tired of being so close to your travel partner), shared bathrooms, linens and towels and - if you are lucky - the same fantastic view. The Twin Private has two single beds, linens and towels and a better-than-average chance of making your friends back home quite jealous indeed. Ladies - for your comfort and peace-of-mind, we offer female-only dorms. If you would prefer to reserve a bed in such a dorm, please make sure to do so directly from the reservation window. If none are available, you are welcome to contact us after booking to double-check. Families - a few of our four-bed dorms are equipped with bunk beds which can be pushed together to form what we like to call a double bunk bed. This has Mom and Dad on the bottom and kids on top. Baby cribs are also available to families traveling with a diaper bag. Please be sure to contact us after booking in order to arrange for this type of room. Space is limited, and family rooms are reserved on a first-come basis. Children under the age of 3 stay for free and children under 12 pay 50%. The same is true for many of the excursions which can be booked directly from the hostel reception. Two guest kitchenettes and private laundry facilities are also available. And with a variety of rooms for up to 200 guests, you'll have no problem meeting interesting new travel buddies from exotic places. Our hostel just oozes personality and soul, just like our guests. Every piece of décor has a story to tell. Using salvaged materials and found objects from various sources, the design is an organic concept blending Iceland’s past with a modern, international twist. 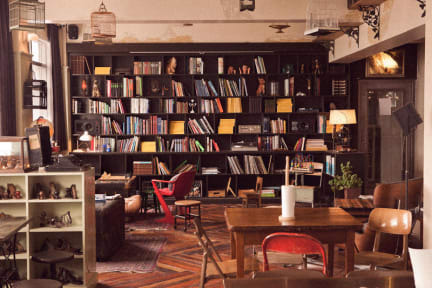 The raw industrial spaces and vintage furnishings combine to give it a homey, eclectic feel. With the affordable nightly rates, you’ll still have enough cash left over to enjoy a few pints of Viking beer or sample some local delicacies like hákarl‎ and brennivín. We’re located in the centre of Reykjavik with a view across the bay to Mt. Esja. The old factory that houses KEX is also home to studios of various artists, dancers, and fashion designers. We’re within an easy walking distance to the city's interesting nightlife, restaurants, shopping streets, cultural attractions and other points of interest in the city centre. To reach those places a little further afield, the hostel is well connected to the city’s public bus system. Stayed here for the Oration festival and loved it! Great staff and nice clean rooms! Best hostel shower I've ever had! Really good hostel, super cozy and pretty clean. They hade lockers in the room, but we didn't get any keys. Kex ligger med gångavstånd till Centrala Reykjavik. Restaurangen och baren är supermysig med fin utsikt mot vattnet. Rummet med 6 bäddar var rent men det var väldigt KALLT vilket inte är så trevligt efter en lång dag ute i kylan. Det större Duschrummet/toaletten var ännu kallare, kändes som att man var utomhus, och man ville knappt klä av sig. Det är väldigt lyhört och man hörde folk i de gemensamma köket på kvällarna samt spelning från baren. I helhet, okej om man ej störs av ljud samt kyla. i stayed here on two dirrefent occations. The first time we stayed here we got a good room with lockers and nice beds. the bathroom though... i did not want to shower and it looked like the bathoom was going to collapse. The faucet in the kitchen almost fell off when i turned it on. the floor is sticky so it sounds when you walk. the next time we stayed here we got a room without cabinets to lock our bags . the bar/restaurant was nice but the staff there did not even smile. good location though.